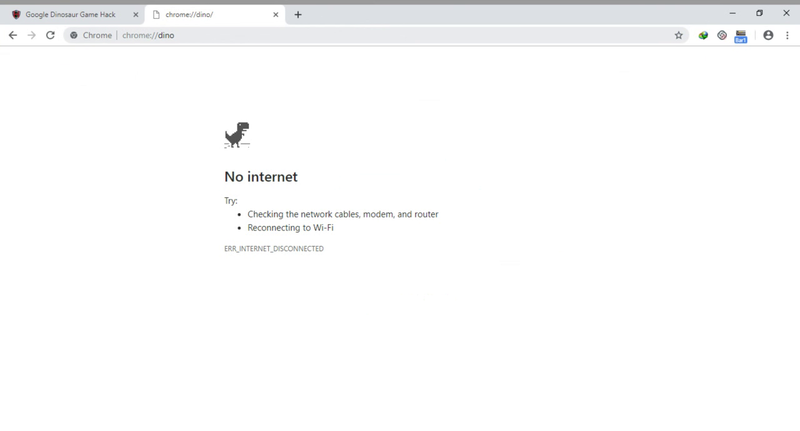 Most of us are already familiar with Google Chrome’s no internet connection error message. 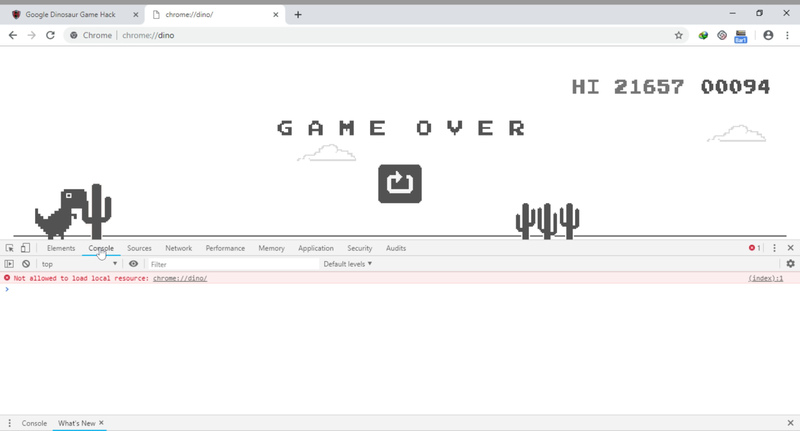 By turning an error message page into an endless running game, Google is helping you turn your frustration into fun. Here is an easy way to play (with and without the Internet) the same dinosaur game and hacking your dinosaur with immortal and speed hack. The good news is that to play this game, you don’t have to disconnect your internet. The bad news is that if you do not have an internet connection, all you can play is play Dino Game. Press the space bar to start the dinosaur game. The game is simple to play to jump again, press the space bar. The game aims to jump over cacti and birds (and sometimes duck below). It’s game over, once your dinosaur hits anything. As you can see in the video at start of the article, you get a ‘Game Over‘ message and are prompted for restart when you hit something. What a great way to pass time. Do you want to beat the highest score that you made? or how about sharing it with your friends and getting some wowwws ? . Let’s beat all the hi scores. 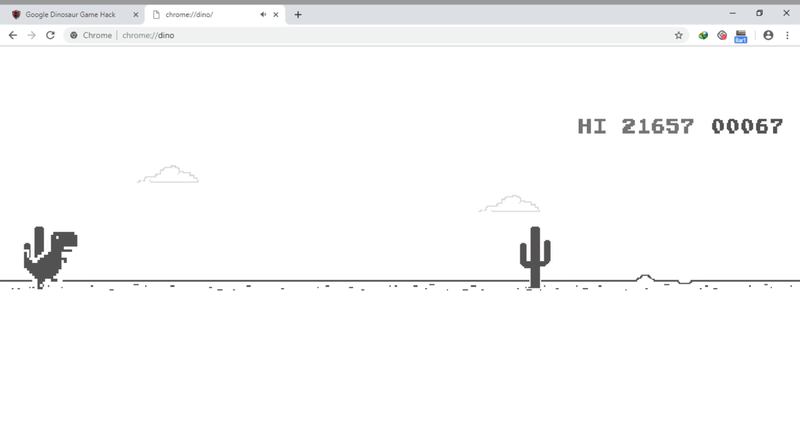 Chrome dinosaur game is easy to hack. Just follow these simple steps to achieve your immortal hack. Start your dinosaur on the error message page. To start the game, press the space bar. Once the game begins, right-click and select the “Inspect” to open Chrome DevTools, select the “Console” tab. You can also use Ctrl+Shift+I shortcut, which brings you directly into the DevTools console tab. Exit Chrome DevTools and return to the game. The dinosaur, as you can see in the video, is immune to the cacti and goes on like it’s on God Mode, Sit back and look at the points. It might get boring to watch the Dino run for minutes , how about speeding up the process ? If you want to speed up the dinosaur, in the console tab, enter the following command. Instead of 1000, you can use any other speed. Its good to have fun with such small games while you can show off in-front of your friends, although it would raise some eyebrows if your high score is insanely high. Whats your high score after applying this hack ?